When I was hauling lovingly carrying my baby around CHA this last winter, I came across the Sassafras booth. They were showing a line called Ellie's Tale. Well for sure it was fate and I had to have this line! Why you ask? My baby, the one I was lugging carrying with me, is named Ellie. What a great name no?! So here I am with a review of this line. Let's go! -Good quality stickers. Love that they are super tacky and will stay put! -Liked the patterns of their papers. Unique for sure. 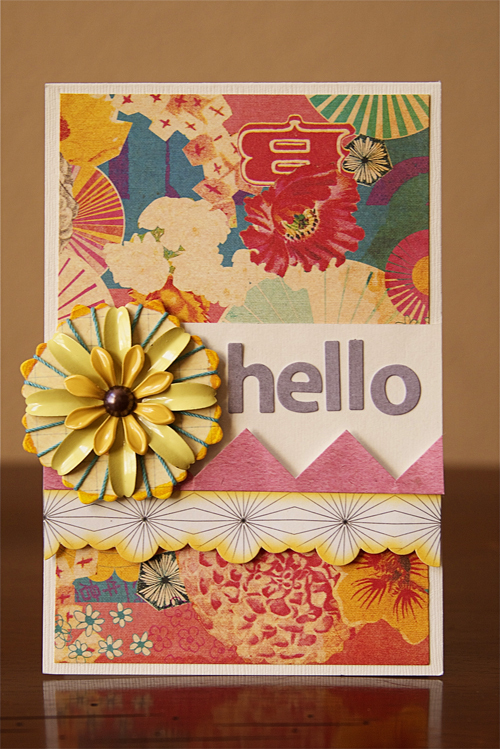 -I always have LOVED the decorative strip at the bottom of the paper that can be cut off and used as a border, accent or whatever you want! LOVE IT!! -Though I liked the different patterns, I felt the colors were a bit harsh. Maybe a bit too strong in color. I would prefer them to be softer. Bottom Line: I did enjoy this line. It was fun to have something personal to our family in the name. Overall a good pick. What do you think? Is this something that you would buy? Is it something you would leave on the shelf? Let us know! We'd love to hear from you!! Cute paper and embellishments. Yes, I think I would buy this and use it for a specific layout. 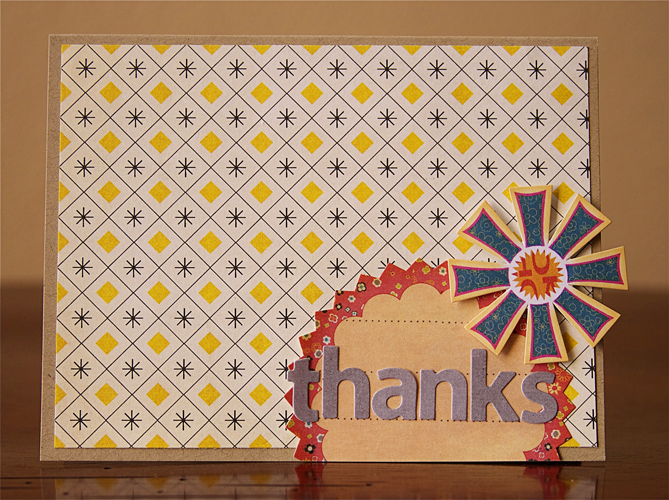 Then any left overs would make cute cards. The pattered paper is bold, but sometimes I need a paper like this. Thanks for the review. 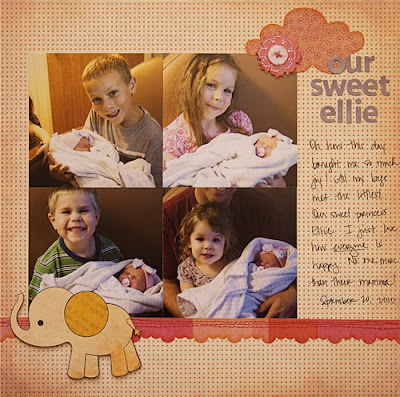 Love your sweet little Ellie and her siblings. Your cards are cute. I think the bold paper makes a great card. I swoon over pretty much anything from Sass. I love their choice of bright, vibrant colors and patterns. And I certainly can't deny that I love their edgy borders :) They are great for any crafty project be it altered things, cards, or scrapbook layouts!! Their alphas are so lovely as well!! Love it all! Great use of the kit! I got it in a kit. At first I didn't think I would use it much, but I've made quite a few cards with it already. I have to say there is something that draws me back to this collection every time, I think it's the color combo. Well, because I love Sassafras so much I would definitely buy this line. So far I only bought a couple of pieces and I haven't even seen the embellishments yet. Love the cute little elephant! I just love this collection!! The patterns are unique and a nice change from the same old, same old that I've been seeing. And I agree that the cut-off border is genius!